Every aspect of our lives, from the way we communicate with each other, shop, bank, to the way businesses are run, there is hardly an aspect of life that remains untouched by the mobile revolution. With the number of mobile-connected devices on the planet exceeding the number of people, the mobile revolution continues to grow. Gartner predicted that by 2020 more than 45% of businesses will have a BYOD policy in place and with mobile devices already surpassing desktop unit sales figures, it is hardly a surprise that corporate L&D teams have jumped on the mobile bandwagon as well. Mobile learning or mLearning seeks to address the new age challenges of a global, technologically savvy and mobile dependent workforce. mLearning may well be the future of corporate learning. Contrary to the obvious definition, mLearning is not eLearning on a mobile device. mLearning involves self-paced, on-demand learning that is delivered in bite-size pieces across contexts. Owing to the impact that mLearning has shown in the effectiveness of content delivery in a convenient and flexible manner, it is expected that mLearning will account for almost 57% of learning technologies. But why has mobile learning become so popular among L&D heads? Here’s why. By some estimate, more than 37.2% of the global workforce is mobile because of the nature of their jobs. mLearning gives this workforce the flexibility to consume learning modules at the convenience of their own time. The content delivered in mLearning is done in smaller, bite-sized nuggets, making it easier to comprehend and learn. Even those employees who are not mobile prefer to access learning information while on the go. mLearning helps training and learning and development programs become more accessible and continuous and available to a wider audience (think geographically distributed teams, or frontline workers with less time to spend in classrooms etc.) mLearning also gives the learner the convenience of setting their individual training schedules around their travels. mLearning facilitates on-demand learning especially for employees stationed in locations with poor computing infrastructure. Be it the sales force who is always on the go or employees who are stationed in, mLearning can easily fit into these dynamic schedules. With the power to learn anytime-anywhere, mLearning puts the power of learning right into the hands of the professionals. It is expected that the millennials will comprise 50% of the global workforce by 2020. mLearning fits in naturally with the needs of this millennial workforce who are proficient and more comfortable in communicating and working on their smartphones. Surveys reveal that 58% of the workforce would be more likely to use an organization’s training tools if the content was broken down into short, easily-accessible, micro sessions. 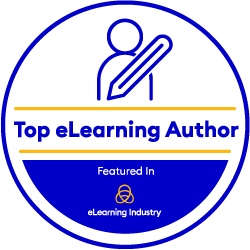 mLearning dispenses information in bite-sized nuggets using strong scripting assets that make the learning module more relevant, and available. With such microlearning, professionals also gain the advantage of setting their individual learning goals and allow L&D teams to make their learning initiatives more targeted, contextual and personalized. Unlike traditional learning modules that depend on large and voluminous learning or training content, mLearning makes information absorption easier by making the content easier to consume. Research suggests that smartphone users finished courses 45% faster on an average. The flexibility to learn anytime, anywhere in a device agnostic manner also serves as an incentive to complete learning programs. mLearning also helps in diversifying learning by allowing L&D teams to curate courses designed to address different learning styles of the users – be it the use of gamification, video content, face-to-face workshops, webinars etc. learning needs can be customized easily for delivery in the mLearning format thereby leading to better learning outcomes. Personalization has been one of the great benefits of mLearning. With technological advancements, mLearning has paved the way for competency-based learning, the next frontier for personalization. Competency-based learning empowers the users to self-pace learning and build professional competency using videos and simulators. This learning method leverages data to assess student progress and focuses on continuous improvement in a proactive manner. In the age where social media interactions sometimes overtake personal interactions, mLearning gives L&D teams the opportunity to integrate social networking into their learning modules. This works well since today’s mobile workforce is connected to their social networks also through the mobile. This integration helps in boosting collaboration as the users can then create groups and events to discuss, brainstorm and share knowledge across social platforms. This social integration assists in crafting more engaging learning experiences that also contribute to better learning outcomes. It’s fair to claim that mLearning gives organizations the clear opportunity to focus heavily on employee enablement and create an ecosystem where the learning and development needs of the individual can be addressed proactively to coach them for success. And most acknowledge that engaged employees contribute positively to the organization’s bottom line. And it works. A survey conducted by CSE Software, Inc., shows that more than 70% of organizations that implemented mobile learning strategies reported greater adaptiveness to market changes than before. Over 75% of these organizations witnessed business growth and more than half reported improved business outcomes after implementing mobile learning strategies. Given all the benefits of mobile learning, it is hardly a surprise that L&D heads and the mobile are new BFF’s. Drop us a line at contactus@enyotalearning.com if you would like to know how mLearning can become your BFF too! Racial Bias or Workplace Sexual Harassment – Why eLearning is an effective solution. Responsive Design in eLearning – Are we ready yet? Does the Role of the Instructional Designer Change in the mLearning Age?